Interlined with fine shimmering ivory soft jersey and fully lined with sumptuous ivory micro-modal jersey for fluid movement. 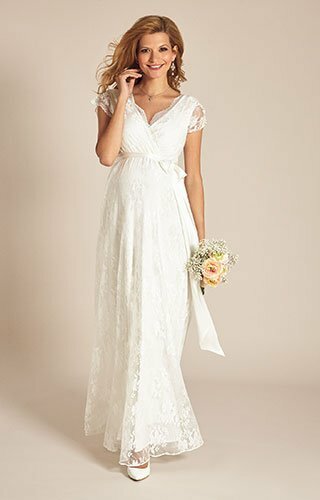 The pretty crossover neckline is accentuated by the demure lace edging. A detachable pure silk ivory satin sash sits prettily between bust and bump, leaving the full skirt to swish dramatically to the floor.